Welcome to MATERIA ISLAMICA the ISLAMIC ENCYCLOPÆDIA! This is an encyclopædia of everything Islamic and Muslim! 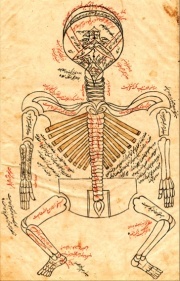 List of Inventions and Discoveries in Medicine During the Islamic Golden Age: The Islamic Golden Age was brought about by three dynasties; the Abbasids (750—1258), the Fatimids (909—1171) and the Umayyads of Cordoba (929—1031). The Abbasids were directly descended from Muhammad's (571—632) bloodline through his uncle, the Fatimids were descended from the daughter of Muhammad, Fatimah (605—633), and the Umayyad's claimed no direct ancestry. The longest of these periods was that of the Abbasids, who were pivotal in leading two crucial revolutions, one military and the other intellectual (particularly following the Battle of Talas (751) which was hugely influential in spreading the technology of paper-making throughout the world—which until then, had remained a tightly guarded secret; although this is somewhat disputed as some evidence suggests that it was already known to the Muslims). The rise of the Islamic Golden Age thus begins in 750 and ends in 1258, when all the dynasties had ceased to exist. The end of the Abbasid dynasty was particularly traumatic, as the Mongols (who were largely illiterate) devastated the capital of Baghdad, destroying much of it's intellectual and historical heritage, and incorporated it into the Mongol Empire (the only people spared were Nestorian Christians, who at the request of Hulagu Khan's (1218—1265) Christian wife, Dokuz Khatun (d. 1265), asked only for them not to be massacred). Many Armenians (12,000 cavalrymen and 40,000 infantrymen) and Georgians also participated in the massacre—of genocidal proportion—murdering between 800,000—2,000,000 people. Khan died several years after the siege and was buried on Shahi Island, Iran, along with his wealth that is yet to be found. The Armenian Kingdom of Cilicia (1198—1375) itself ceased to exist in 1375, when the Mamluk Empire (1250—1517) conquered it. Kuala Lumpur, one of the greatest cities in the Islamic world. Kuala Lumpur is a city that is the capital of Malaysia, and is one of the best cities in the world today. With a thriving tourism industry, private and manufacturing centre and it's close proximity to Singapore, Japan, and South Korea, Malaysia is on the very edge of the world, and is truly an experience of Asia. A Pakistani man who boarded a flight to Saudi Arabia forced a plane to turn around and land because he was shouting his wife had died. Sympathetic the pilot turned the plane around and landed the plane. It transpired the man simply missed his wife who he was deeply in love with! He couldn't simply stay away and be detached from her for long! In a significant step forward for human rights and equality, Canada leads the world by passing a motion condemning Islamophobia, called the "M-103" bill. Racists are shocked, and have begun hailing accusations of White genocide and the end of civilisation. Malia Bouattia, head of the National Union of Students, is awarded the Good Citizenship Prize, which included a vote from a Jewish Rabbi. Bouattia has long suffered from a with-hunt by the Israeli government who wants to silence her freedom of speech. Bouattia is an ardent support of freedom and equality. India, once again, is evicting hundreds of thousands of Muslims under the excuse of forest preservation. The Hindu majority, uncaring as always, ignores the issue and fails to protect their minorities. They also elect a Hindu religious leader in Uttar Pradesh who stated committing necrophilia on Muslim women was totally okay. The Pakistani courts deem it appropriate for a man to convert from Islam to Judaism in a significant step forward for freedom of expression in the country, showing that the majority Muslim nation is secure with it's own Islamic beliefs. It should be noted that Pakistan does not have any apostasy laws. Increasingly threatened by the increasing popularity of the boycott of the apartheid state of Israel, pro-Israel groups barge into a Palestinian solidarity meeting, and intimidate crowds by yelling racist toxic Islamophobic slogans, whilst at the same time throwing about accusations of "antisemitism". The Israeli media later falsely claims that the crowd started a "pogrom" against Jews, whilst the other compared it to the "Warsaw ghetto". To show all types of Muslims that they have a collective identity, no matter their background and religiousity; and also to show some non-Muslims that we too have our own story. This is why our articles are primarily in English. What Types of Muslims is this Project Targeted Towards? Anyone. Muslim Muslims, Agnostic Muslims, Atheist Muslims, Cultural Muslims, Religious Muslims, Ethnic Muslims, Nationalist Muslims, and Ex-Muslims—basically whatever you call yourself. Even non-Muslims. Are you Affiliated with Wikipedia or it's Sister Organisations? No, we are not a part of Wikipedia. What Makes You Different from Wikipedia? Despite some valiant efforts by some of it's users, the overall user-base is not neutral when it comes to Islamic culture, beliefs, history and politics. There's a plethora of problems over at Wikipedia, and almost none of them will ever be resolved. Where's the Proof That Wikipedia Has This Problem? Islam related or Muslim related articles hosted on Wikipedia often end up having the Muslim point-of-view totally or partially removed, making things unnecessarily negative, and in some cases are even censored out. This is particularly the case when it comes to persecution of Muslims in India for instance where glaring facts are routinely omitted or mass deleted even after they've been put in or discussed to death. Another example is the realisation that the world's first university, which was founded by a woman in Morocco, does not appear anywhere on Wikipedia's main article that deals with the oldest universities in the world. No, publicly editable encyclopaedias lead to incongruency, point-of-view, edit wars and unreliability. This project aims to correct the mistakes of Wikipedia (and other websites). This page was last modified on 22 March 2019, at 03:28.